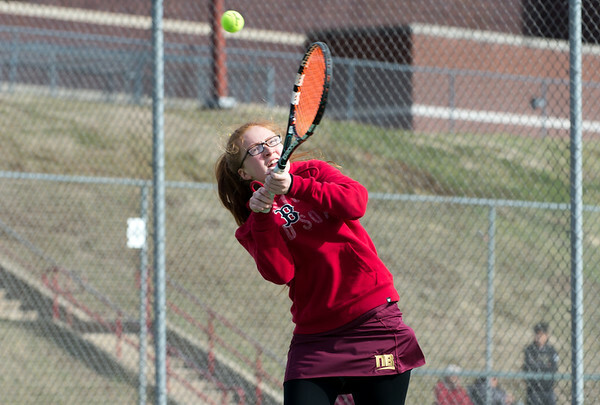 NEW BRITAIN - New Britain girls tennis head coach Joe Canzanella credits his team’s solid start to the season to a mixture of luck and preparation. Whatever is really behind the Hurricanes’ early surge, it was again on display on Thursday, when New Britain claimed three of four singles matches to earn a 5-2 victory to move to 4-0 on the season. JuJu Oliver got the Hurricanes on the board in first singles, while Jen Ketkeoasmy and Audrey Belliveau secured tiebreaking wins in singles to come away with a pair of pressure-packed victories. The Hurricanes’ first doubles team of Danya Alboslani and Yajaira Asimbaya lost their match, but the two remaining doubles teams earned wins to make up for it, including a comeback win for Layla Sahoobah and Zoe Buley, who dropped the first set before turning things around. Southington 7, Manchester 0: The Blue Knights continued to roll through the early portion of their schedule on Thursday, blanking Manchester 7-0 for its third straight win to open the season. Southington has now won its first three matches by 7-0 scores. Abby Murphy started the Blue Knights off with a dominant 6-2, 6-0 win over Sammi Zhang, and Jillian Watson rounded out singles with a convincing 6-1, 6-0 win over Dara Song. The doubles success was highlighted by Gianna Wadowski and Avery Korp, who won by scores of 6-1, 6-1. Newington 14, E.O. Smith 8: The Indians’ Matt Bradley made history on Thursday, recording eight assists to move past Connor Brennan on the program’s all-time points list. Bradley’s eight helpers give him the most career points in team history, after Brennan graduated last season. Owen Freeman paced the Newington offense with six goals, while adding an assist of his own. Scott Robidoux added four goals and an assist as well, but by the end of the night, the story was Bradley, who now stands alone atop Newington boys lacrosse. Posted in New Britain Herald, New Britain, Newington, Southington on Thursday, 11 April 2019 21:20. Updated: Thursday, 11 April 2019 21:22.